By Dorothy A. Pettit, Ph.D. and Janice Bailie, Ph.D. I worked on this book for almost a year. 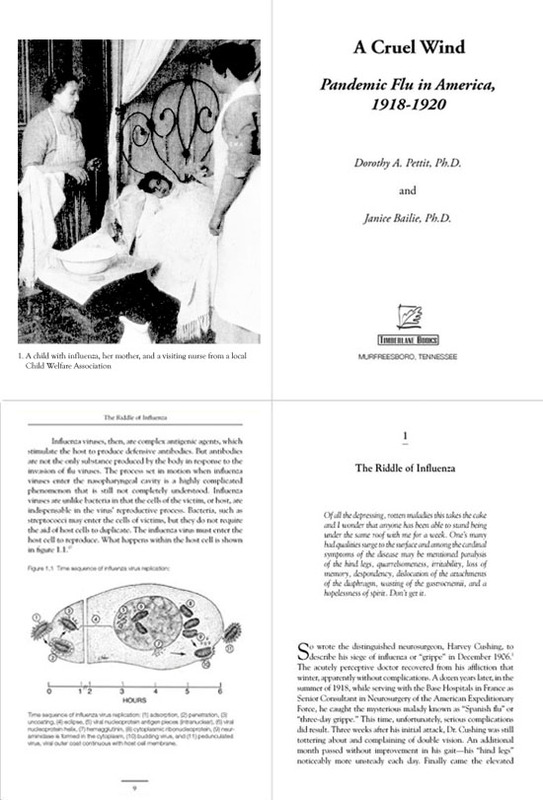 It is an in-depth look at the pandemic flu of 1918 and will be of interest to many, particularly in light of the recent swine flu outbreaks. Matthew’s killers have been tried, convicted and sentenced, but Sandra Martins-Toner and her family can’t escape their grief, and the overwhelming sense of loss. They have channeled their anguish into affirmative action for victims. 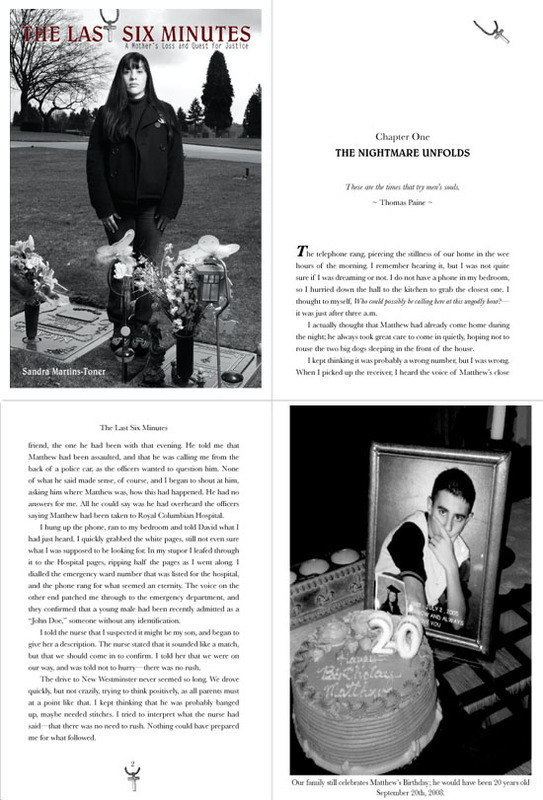 “The Last Six Minutes” is the true account of the random and violent murder of 16 year old Matthew Martins, and his family’s journey through the Canadian Criminal Justice System. Now the family is faced with the Killers appeal, and the torment of perhaps being subjected to yet another lengthy trial. My heart goes out to Matthew Martin’s family and I am in awe of Sandra Martins-Toner’s fight for justice in a time of such loss. Anyone who knows me, or has talked with me a bit knows that I am very big on excellent communication – both in business and personal venues. Getting a book ready for print involves a series of steps, each one affecting the other, and when the “big picture” goes out of focus, communication is the key. Many times when a book reaches my stage — the interior book design and typesetting — it’s now in a “RUSH” stage. Having worked in the Printing industry for over 30 years, I am no stranger to deadlines, so I understand “RUSH” but I would like to communicate my thoughts on the process involved in what I do and the time it takes. So grab a cub of coffee and a comfortable chair…. While something like that can be done, and is done – it usually results in a book with a poor design or laden with errors. Three weeks may seem like a lot of time, but the printer alone usually needs one to two weeks, if not more to print, trim and bind the books. At this point, a client realizes just how many steps and how much thought goes into putting a book together and this is “OUR” starting point. 2. — Review your cover design to see if there are any elements I can pull from it to use on the interior design, such as a graphic or piece of a graphic on Chapter or Part pages. 4. — Once I come up with a design, I present that to you in the form of Sample Pages — usually the Front Matter and part if not all, of the first chapter. This is for your review to decide if you like this and want your entire book to look this way before I typeset your entire manuscript. This is your chance to see your book come alive –out of the Word Document and into a professionally designed layout. It’s a very important part of the process. This is when we tweak the job and maybe change a font, a size, nudge something over a bit, etc. This step determines how your entire book will be layed out so it’s crucial at this point to put time into reviewing it — and having any changes to the layout you want made now — before the typesetter has done all the work on all of the pages. 5. — After we decide on a page design, I then take your final clean manuscript and import it into my design in inDesign (or Quark) and I use the tags and master pages I create to format your entire book. Yes, i actually have to format every page of the book — it doesn’t matter that the Word document was formatted — the Word document becomes ancient history once I import it into inDesign. That’s where I work my magic and create what I hope will be, an award-winning book. It usually takes me 7 to 10 days to typeset a book – sometimes longer if there are a lot of pictures or formatting. This is the stage where I place and size your pictures, photos, diagrams, format and place the captions, side bars, pull out quotes and all the other elements of your book. 6. — After I have typeset your book I present you with a PDF file for your review. At this stage the book is about 90% complete and ready for your proofreading to see if you have any last minute clean up edits or fixes, or your eagle catches anything I missed or any glitches in the formatting. 7. — After a thorough review by your editor/proofreader/you, etc. you then give me a list of changes or corrections you feel need to be done before the book can go to print. This is where proper communication from the start comes in. ANY CHANGES YOU MAKE TO THE BOOK THAT WILL AFFECT THE FLOW AND LAYOUT OF THE BOOK WILL ADD TIME AND COST TO YOUR PROJECT. I cannot stress that enough. I am not talking about changing a word or a comma, etc. I am talking about MAJOR changes that affect the page flow. If that happens, the entire book virtually needs to be layed out – and pictures and captions and sidebars and pull quotes and everything has to move from its current location. Please note, I am not complaining, I am EXPLAINING. I absolutely, hands down, 100% love my work, love books and am grateful to be in business for myself. I just need to make sure I am clear in my communication to you, my valued client, in how a book is put together. Continuing on…. 8. — After I receive your post-proof revisions, I go to work to get them done and keep you informed of any problems and query you with anything I might not understand in your direction. I then present you with 2nd pdf proof for your approval. 9. — Steps 7 and 8 are repeated as necessary until you are sure your book is good to go, I finalize the Table of Contents, you sign off on the book and we are almost finished. 10. — I run a file preflight print check of your files, and create a HIGH RES PDF for your pinter according to their specs. At that time you can upload the file or email it or send it via CD to your printer. This is the basic process involved in putting together a professioinally designe and typeset book after it has been written, edited, and proofread. As you can see, my step in the process is multi-faceted and truly determines what the fruits of all your labor will look like when it reaches the public eye. www.JustYourType.biz or email me at sue@justourtype.biz. Entry for March 6, 2009 Here’s a poem I wrote and want to share today. … in all the wrong places. 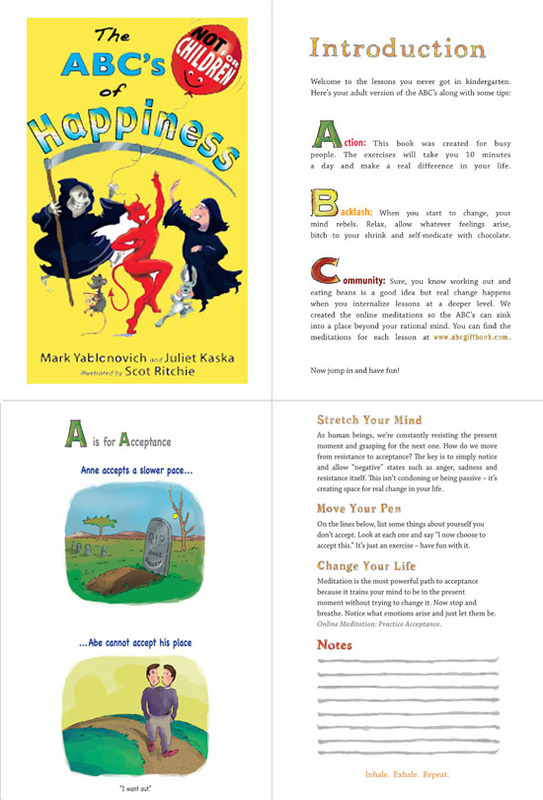 The ABC’s of Happiness (Not for Children) is the lastest featured book of those I have worked on over the past 12 months. This book was unique and fun to work on. The drawings in the book are some of the most beautiful I have seen in any book I have worked on or seen in other books, for that matter. They are colorful, vibrant and just fun to look at. Working with Mark Yablonovich on this book was a true labor of love – Mark and his team were maticulous and spent many hours making sure each illustration and its text and captions were just right. MARK YABLONOVICH graduated from Harvard Law School and built one of California’s top employment class action law firms. He then pursued his passion for bringing meditation to the workplace and now leads meditation and stress reduction seminars for organizations across the United States. JULIET KASKA is one of the nation’s premiere fitness experts. She has been featured on The Dr. Phil Show, Good Morning America, Extra Hollywood, Vogue, Shape, SELF, W, Los Angeles Magazine, Weddings, US Weekly and People. SCOT RITCHIE is an award-winning illustrator who has been drawing and writing for over 20 years. He has worked with everybody from The Wall St. Journal to the National Film Board of Canada. Entry for December 2, 2008 – NEW FEATURE of JustYourType.biz Blog! Today begins a NEW FEATURE of JustYourType.biz book design and book typesetting! I want to start today with a book that I am very proud to have designed and also had a lot of fun with the book design and typesetting, which is always nice! The title of the book is “Jeremiah Bloom and the Amulet of Osiron” by Stephen Wren. Stephen Wren is a Registered Respiratory Therapist by education, a member of the SCBWI, and has always had a love for writing. In addition to creating middle-grade and YA fantasy novels, he also serves as the director of TN Paranormal and the radio producer for a paranormal talk radio program. He lives with his family in Tennessee. Entry for September 29, 2008 Why Can’t You Make a Book From My Word Document? This is one of the most common questions I am asked, still to this day. A client has created their manuscript in Word. They have bolded and italicized and put in headings and sometimes page numbers and running heads. 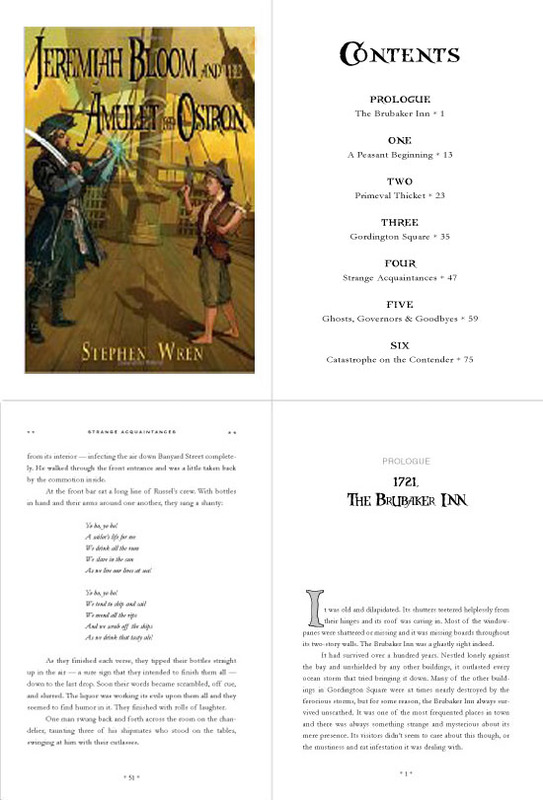 Books are professionally typeset in InDesign or Quark Xpress. The Word document becomes extinct once it is imported into one of these page layout programs. I will use inDesign to mean “professional page layout program” for simplicity’s sake. Why can’t I just fix up the Word Doc and make a book? inDesign gives me the ability to set up master pages, paragraph and character style sheets, control things like kerning, tracking, widows and orphans, hi res graphic placement and manipulation and so much more. A picture pasted into Word is just a “screen representation.” it is no longer a graphic. And – it’s often a screen shot or low resolution (72 dpi RGB) image when it needs to be a HIGH RES, grayscale or CMYK tif or eps image separate from the document itself. The pictures are then “linked” when they are placed into the inDesign layout and the fonts and pictures are “collected” and the document is run through a pre-flight program to check for missing fonts, it checks resolution and type of graphics and all that good stuff that printers need in order to use the final “printer-ready PDF file” to print from. Preparing a Word document is a very important step for the typesetter and something I will cover in an upcoming Blog Entry very soon.